Heat oven to 350°F/180°C. Line an 8×8-inch baking pan with parchment paper or aluminium foil, leaving enough overhang on the sides for lifting the brownies out after baking. In a large heat-proof bowl, place chocolate and butter. Heat in the microwave in 20-second intervals, stirring in between each interval, until melted (or set it over a saucepan of simmering water, stirring occasionally). Add sugar and mix until combined. Add eggs, one at a time, and whisk until combined. Add nuts, cornstarch, and salt and fold, using a rubber spatula, just until combined. Do not overmix. Pour batter into prepared pan. Bake for 20-25 minutes, until the edges are set but the center is still very soft. Be careful not to overbake. 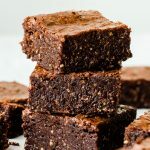 A toothpick inserted into the center of the brownies should come out with moist crumbs, not dry. Transfer pan to a wire rack, and let it cool completely. Refrigerate until completely set for easy cutting, at least 4 hours. Lift brownies out of the pan using the parchment paper and cut into 16 squares. Store brownies in the fridge in an airtight container for up to 5 days.